I love the weather and I love the food! And it doesn’t have to be all about the pumpkin desserts either! 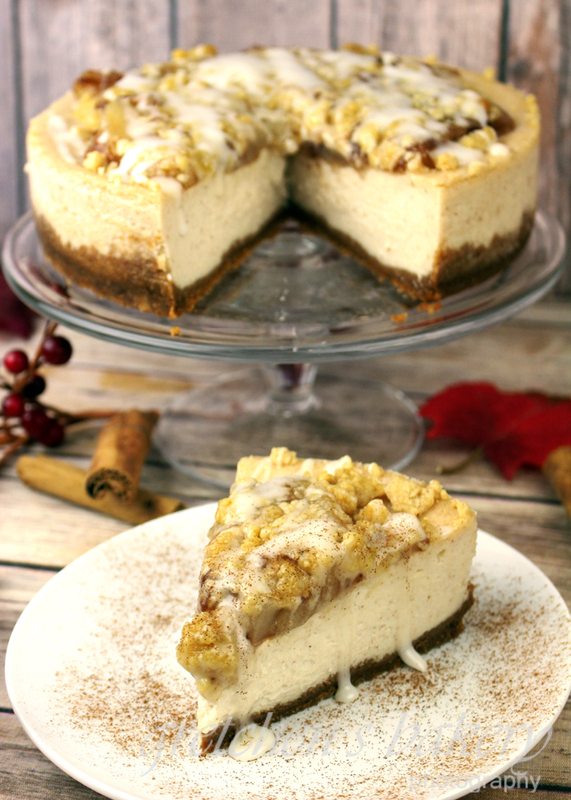 Apples are also in abundance so let’s turn them into a luscious, creamy Apple Crumb Cheesecake! As you may know about me by now, I also love CHEESECAKE! With just two simple recipes you can make this amazing cheesecake that will have everyone in disbelief that it is indeed vegan! This cheesecake is going to change how you (or your most defiant carnivore) feel about vegan desserts! Creamy cheesecake on a traditional graham cracker and gingersnap cookie crust with apple topping and crunchy buttery streusel topping! I always make my streusel topping in bulk and have it in the freezer for whenever I may want to streusel-ize something, but the recipe below is for just the amount you need for this cheesecake. Simply tripe it or quadruple it for a bulk recipe to have in your freezer! I'm using a blend of gingersnap cookies & graham crackers for the crust, but you can use all of one or the other as you prefer. 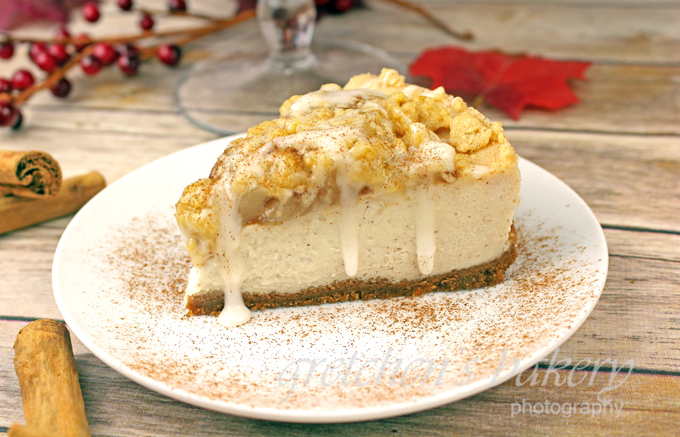 You will notice I am also using the Plant Based Egg egg replacement in this recipe, and while it is not imperative, I do think it adds to the final texture and creaminess of the cheesecake. If you do not have it or do not want to buy it, you can leave it out no changes. First prepare the streusel topping by combing brown sugar, granulated sugar and vegan butter and get it creaming on medium high speed. Sprinkle it out onto a parchment lined sheet pan and freeze while you prepare the cheesecake. If you are making your own apple pie filling, prepare the recipe according to the instructions on that blog post. then reserve. Next make the crust combine the melted vegan butter with the graham crumbs and ginger cookies, the spices and the sugar is using, in a food processor and process to the consistency of wet sand. After the total 65 minutes of bake time, turn the oven off but leave the cheesecake inside to cool for another 40 minutes, then refrigerate for at least 5 hours or overnight before unmolding. Cheesecake must be stored in the refrigerator and will stay fresh for up to 10 days wrapped well. Yummy yummy. I like the inclusion of the tofu to lighten it up. Balances out the fat:protein ratio a little too. Good call Gretchen. The Plant Based Egg product is kind of pricey on Amazon for the amount used (have to buy 3 bags for $27). Is there another egg replacer you’ve tested that could be substituted? Ooh yes why didn’t I think of that? Thank you! Is there a reason you use Tofutti instead of Kite Hill or Miyokos? Also, I’m making this in a 6 inch pan. I’ve tried using this exact recipe in a 6 inch and it changed the cook time and made the cheesecake too tall for my liking. How would you convert this recipe to a 6” pan? I think the tofutti works GREAT in baking. I have tried Kite Hill and I did not prefer it. The only time I like Kite Hill (ricotta) is in my lasagna recipe but NOT for baking. However it is all preference and you can certainly use one over the other if you prefer.